The FBI made public Friday afternoon dozens of pages of its investigation into whether former Secretary of State Hillary Clinton improperly handled classified information with her use of a private email server during her time in President Obama’s cabinet. The FBI, responding to numerous Freedom of Information Act (FOIA) requests, released a summary of Clinton’s July 2 interview with the FBI, along with other documents related to the case. The 58 pages of documents include notes from interviews with Clinton’s various State Department aides, as well as details about how the server was set up in the basement of Clinton’s New York home. Several pages remain completely blank or otherwise contain heavy redactions. Among the questions that came up during the investigation was whether or not the server was actually hacked, and though the FBI said it could not be ruled out conclusively, the documents say there is no evidence that the server was actually hacked. The investigation documents also note that there were up to 13 different devices from which Hillary Clinton accessed her email, eight of which were used by her while she was secretary of state. But the FBI was unable to examine the devices since her lawyers at Williams & Connolly were “unable to locate any of these devices,” according to the FBI release. One aide, Justin Cooper, told the FBI that he “did recall two instances where he destroyed Clinton’s old mobile devices by breaking them in half or hitting them with a hammer,” according to the documents. The agency noted that Clinton -- when she contacted former Secretary of State Colin Powell, who also used a BlackBerry and private email during his tenure as America’s top diplomat -- was advised to “be very careful” in January of 2009. Clinton told the FBI that she did not recall receiving any emails she thought should not be on an unclassified system. She relied on State officials to use their judgment when emailing her and could not recall anyone raising concerns with her regarding the sensitivity of the information she received at her email address. “Based on her doctor’s advice, she could only work at State for a few hours a day and could not recall every briefing she received,” the agency noted. 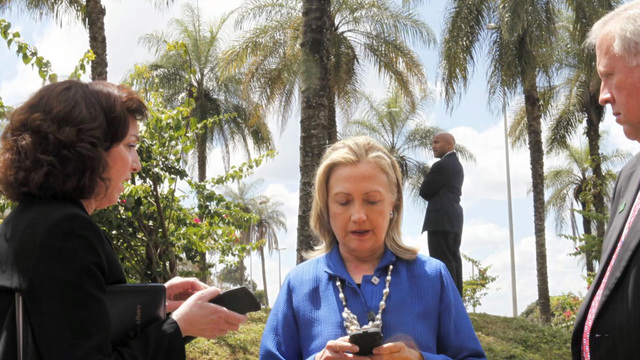 Based on her practice of emailing staff on their official State Department email accounts, Clinton assumed her communications were captured by State systems. According to the documents, the Democratic nominee specifically denied that the use of a private server was due to a desire to avoid FOIA requests or violate the Federal Records Act. Still, the FBI records showed aides did, in fact, purposely delete content from their accounts. After over a year investigating Clinton’s server, FBI director James Comey did not recommend any criminal charges to be filed against the Democratic presidential candidate. Comey noted, however, that Clinton and here colleagues were “extremely careless” in their handling of classified information. Clinton’s campaign spokesperson, Brian Fallon, applauded the FBI release. House Speaker Paul Ryan, R-Wisconsin, blasted Clinton as “reckless” following the FBI release of the documents, reiterating again his call for the Democratic nominee to be denied access to classified briefings during the election cycle. Top Democratic Rep. Elijah Cummings of Maryland also weighed in on the FBI document release, praising the agency but also encouraging the department to release other documents from their investigation. Democrats on the House Committee on Oversight and Government Reform, on which Cummings serves as the ranking member, also pressed Secretary of State John Kerry to release the Powell emails in question, invoking in a letter the “Seven Member Rule” to obtain full, unredacted copies of their exchanges. CBS News’ Paula Reid and Julianna Goldman contributed to this report.